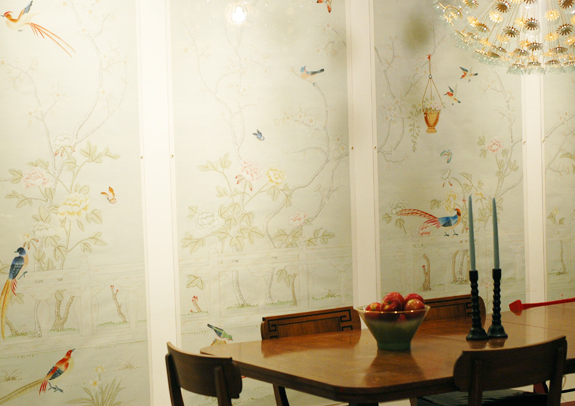 We are continuing with our series on how to use Chinoiserie panels in your own home. First we looked at Barrie Benson's modern approach framing traditional Chinoiserie panels in black molding. Next we took a peek at Ellen O'Neill's sepia toned monochromatic apartment. Today we see a wonderful DIY project. 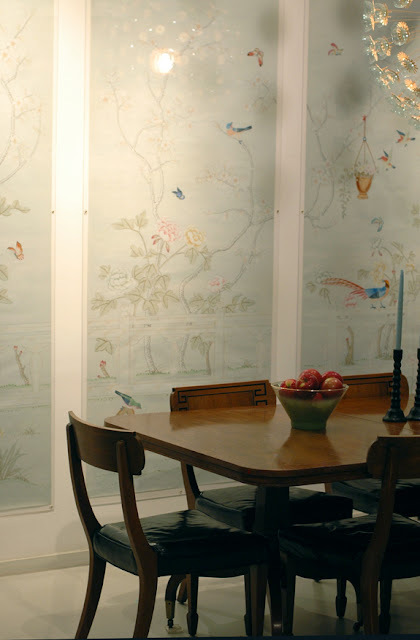 Jenny Komenda of Little Green Notebook used plexiglass sheets, Command poster hanging strips, and brass buttons to frame a beautiful, portable, and inexpensive set of Chinoiserie panels for her dining room. See the entire project here. You will find a gorgeous collection of Chinoiserie panels at The Decorator Archives allowing you to create this very high end look in your home.